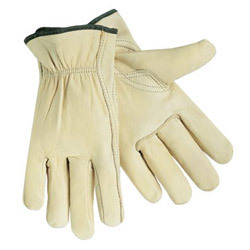 Durable, cowhide leather gloves provide comfort and convenience for any workplace. Flexible, keystone thumb offers added mobility. Applications include construction, farm equipment, utility work and general maintenance where greater dexterity is required. Color-coded hem to identify size. Style: Drivers'; Wrist Style: Shirred; Material(s): Cowhide; Thumb Style: Keystone. Driver's Gloves from Memphis Glove! 601 In Stock today.